As you already know, we finally managed to reach the end of Mahi Siah e Koochooloo. To change your mood, and to refresh your thoughts on what you have so far studied, in the next coming weeks I will have a review of the previous lessons. I really hope you will find this helpful. Please feel free to share with me (and with other students) your comments; there is power in your words :D.
Let’s begin with ‘the tenses’ and go back to the very beginning: Simple Past Tense. If you have no clue what I am talking about, please visit Lesson 11 first, and then come back here. 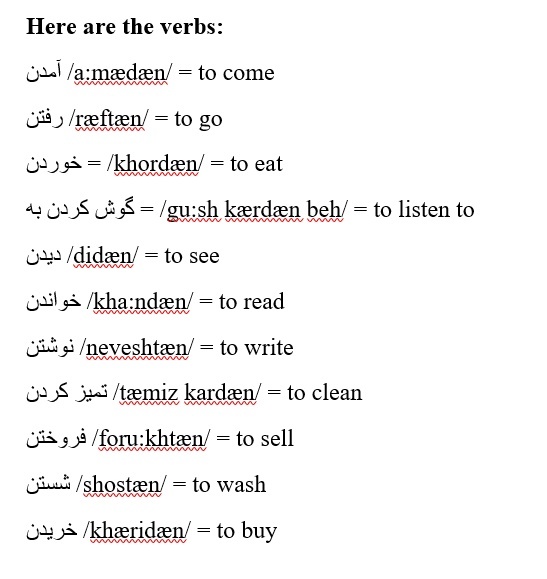 What I will do is very simple: I’ll pick ten Persian verbs, and will present them to you in ten English sentences in Simple Past Tense. 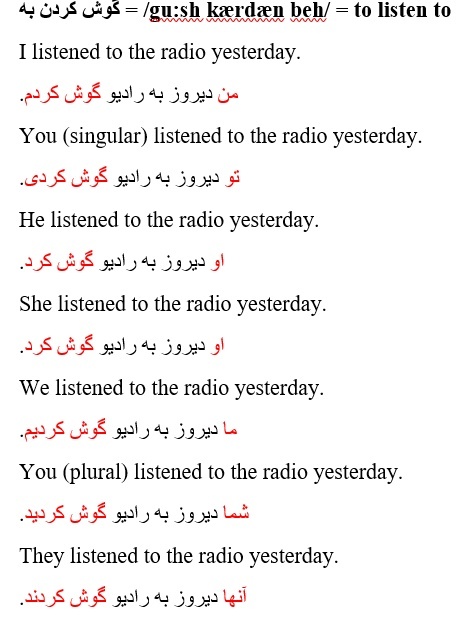 All you have to do is translate the sentences to PERSIAN. Don’t’ worry; I’ll give you the English translation of the words, and will provide you with examples to follow. To translate words (NOT sentences or phrases), you can use Google Translate. When you are done with the translation, scroll down the page and compare your answers with mine. You have done this translation drill before, and I am sure you can do it again. Feel free to share your translation with others in the Comment section. Thanks. I came to London last year. من پارسال به لندن آمدم. You (singular ‘you’) came to London last year. تو پارسال به لندن آمدی. He came to London last year. او پارسال به لندن آمد. She came to London last year. We came to London last year. ما پارسال به لندن آمدیم. You (plural ‘you’) came to London last year. شما پارسال به لندن آمدید. They came to London last year. آنها پارسال به لندن آمدند. I ate a lemon last night. 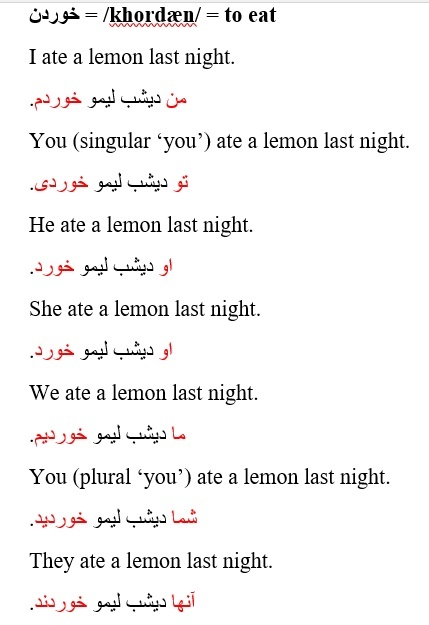 You (singular ‘you’) ate a lemon last night. He ate a lemon last night. She ate a lemon last night. We ate a lemon last night. You (plural ‘you’) ate a lemon last night. They ate a lemon last night. I listened to the radio yesterday. من دیروز به رادیو گوش کردم. You (singular) listened to the radio yesterday. He listened to the radio yesterday. She listened to the radio yesterday. We listened to the radio yesterday. You (plural) listened to the radio yesterday. They listened to the radio yesterday. I saw your friend yesterday. من دیروز دوستت را دیدم. You (singular ‘you’) saw your friend yesterday. He saw your friend yesterday. She saw your friend yesterday. We saw your friend yesterday. 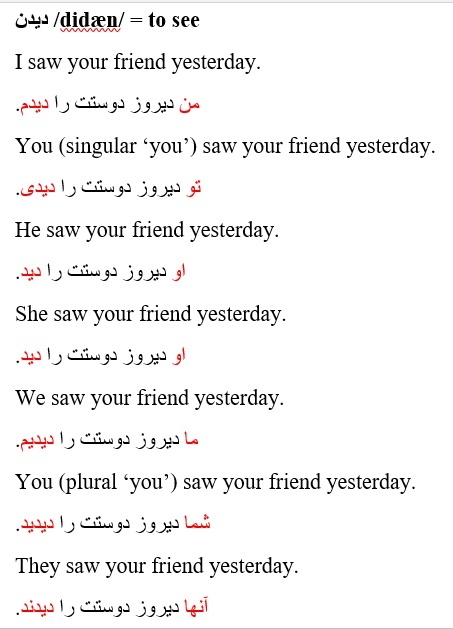 You (plural ‘you’) saw your friend yesterday. They saw your friend yesterday. I read a book last week. من هفته ی پیش کتابی خواندم. 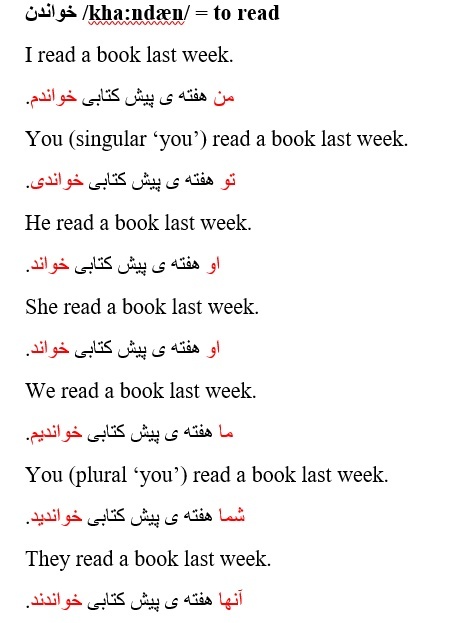 You (singular ‘you’) read a book last week. He read a book last week. She read a book last week. We read a book last week. You (plural ‘you’) read a book last week. They read a book last week. I wrote a letter today. من امروز نامه ای نوشتم. 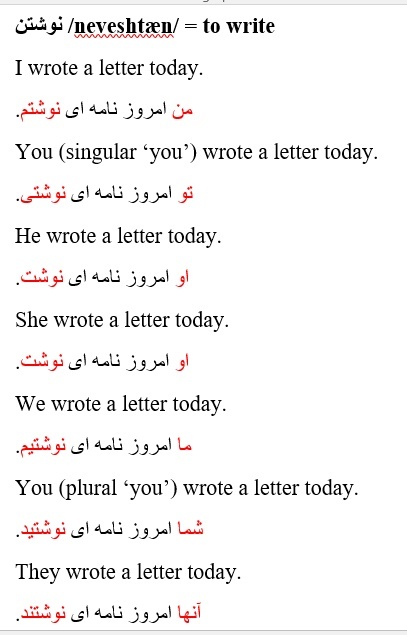 You (singular ‘you’) wrote a letter today. He wrote a letter today. She wrote a letter today. We wrote a letter today. You (plural ‘you’) wrote a letter today. They wrote a letter today. I cleaned my car this morning. من امروز صبح ماشینم را تمیز کردم. 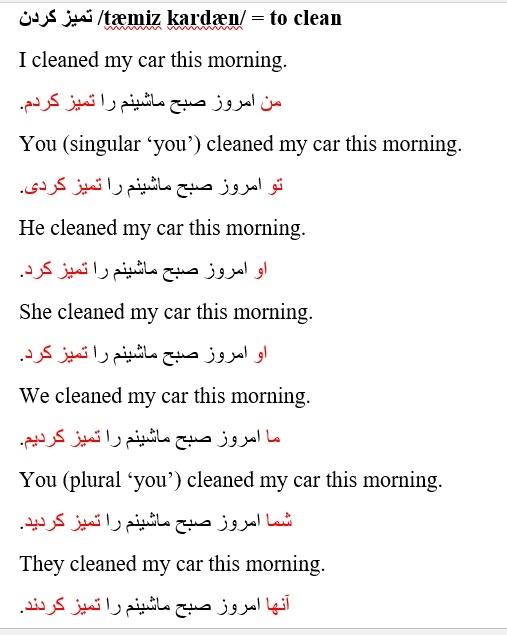 You (singular ‘you’) cleaned my car this morning. He cleaned my car this morning. She cleaned my car this morning. We cleaned my car this morning. You (plural ‘you’) cleaned my car this morning. They cleaned my car this morning. I sold my house two years ago. من دو سال پیش خانه ام را فروختم. 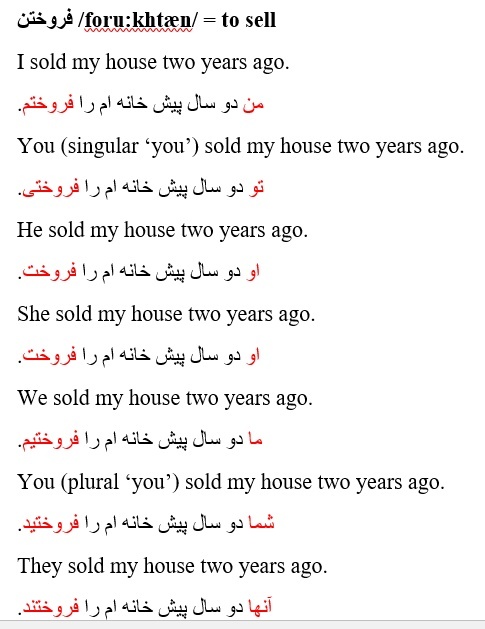 You (singular ‘you’) sold my house two years ago. He sold my house two years ago. She sold my house two years ago. We sold my house two years ago. You (plural ‘you’) sold my house two years ago. They sold my house two years ago. I washed the dishes last night. من دیشب ظرف ها را شستم. 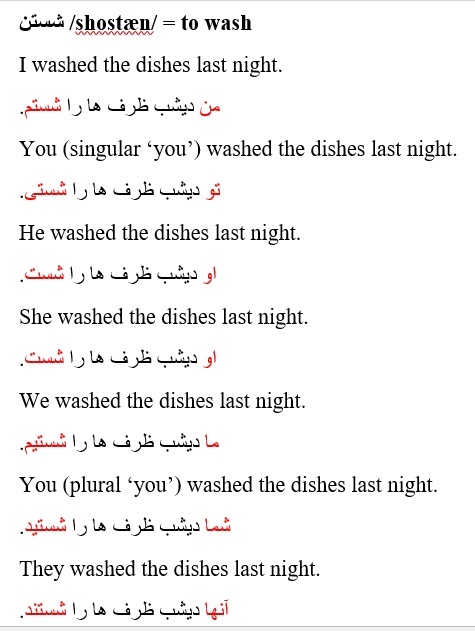 You (singular ‘you’) washed the dishes last night. He washed the dishes last night. She washed the dishes last night. We washed the dishes last night. You (plural ‘you’) washed the dishes last night. They washed the dishes last night. I bought a car ten years ago. من ده سال پیش ماشینی خریدم. 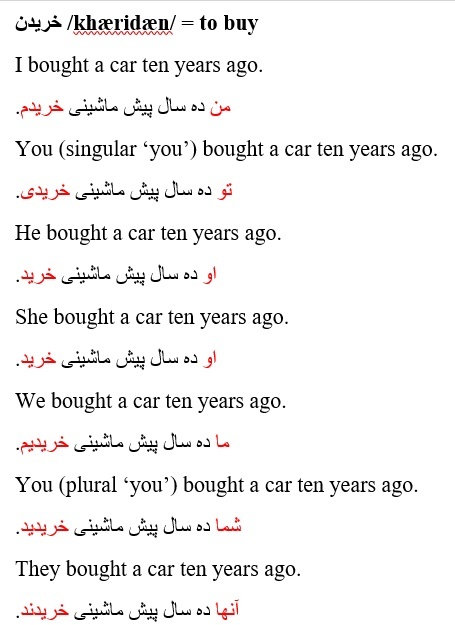 You (singular ‘you’) bought a car ten years ago. He bought a car ten years ago. She bought a car ten years ago. We bought a car ten years ago. You (plural ‘you’) bought a car ten years ago. They bought a car ten years ago. Ok. Hope you liked it. Don’t forget to check the Useful Drills and Let’s Write pages. See you next week.